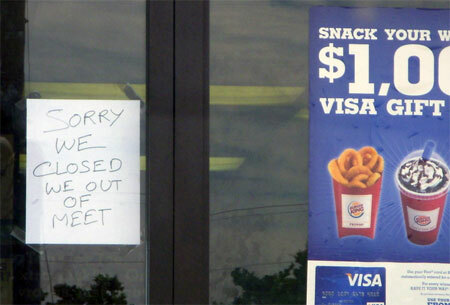 Fast Food News: This BK Is "Out of Meet"
This Burger King is on Island Avenue in Southwest Philadelphia. I am embarrassed to say this but I've been to this location twice in the past 2 months. Both times I tried to go through the drive-thru, and both times I drove away without ordering. First time she told me they were temporarily closed, even though the car in front of me was served. 2nd time she told me they were only taking orders at the front counter. This is nuthin'. In New York you see mistakes like this on professionally printed signs.